Here’s a pretty interesting September question to get your mind working on something other than how to handle the impending mood dampening effects of the cold-weather months. Would you rather be the sun rising late or the sun setting early? Huh. It’s hard because there are different minuses with each of them. Some of you may be thinking right away that it’s odd to be put in the position of making a choice between the sun rising late and the sun setting early when soon we will be subject to both of those, and it will be a terror. Well. For the people with that complaint I’d like to point out that making a choice is the whole thing of this series. 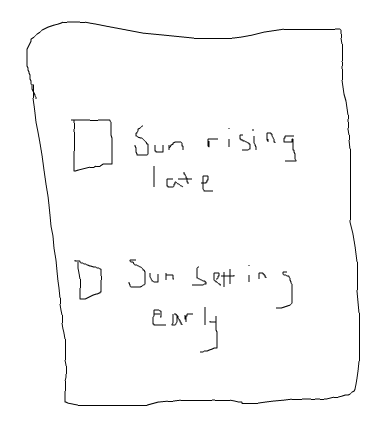 If the choice element were removed there would be nothing to check on the form to indicate your preference before you mail it to Awl HQ; it would just say “YOU ARE SUN RISING LATE AND SUN SETTING EARLY” and you’d keep it for yourself in a private folder where you keep your duplicate copies of previous “Would You Rather Be” answer forms. So we have a choice. Are you sun rising late or sun setting early? Implied in the question is that what you’re choosing is what you think the lesser of the two “evils” is — and, actually, implied in the question is the false thought that if you’re the sun setting early the sun will rise early, and if you’re the sun rising late the sun will set late. We know that this is not how the sun works, sadly. But this is just a game. So, here we are, and which are you? If you’re the sun rising late you wake up in darkness. The alarm rings and it’s nighttime outside and you have to get up and do your morning routine in darkness, and then go to work, sleepy and sad. If you’re in a high school with uniforms, perhaps you fall out of bed and crawl to where you laid out your uniform the night before and put in on while sitting on the floor, cold, because you are tired and it’s dark and you’re in high school and you’re me and that’s the most distinct cold and dark morning memory you have, I guess because you did it every dark and cold morning day for many years because you also did it in grade school. But — and I know this isn’t how it works, but I’ve already explained it so get off of my back — you get out of work and the sun is still up (briefly). (That part doesn’t apply to those in high school.) It is not summertime sun, but it doesn’t set at 4PM like it would if you’re the other option. That’s pretty nice. You get to have a little light at the end of the day, before it’s dark again for you until the next end of the day. Maybe you’d like that. But the next day, again, you would wake up to darkness. Maybe you’d like it better if the sun rose earlier. You wake up to the sun, your face warm from daylight outside of your window. Your apartment, or whatever you have, home, etc., is illuminated. You make coffee in the daytime, before you commute to work in sunlight. Then you watch the sun set at 4PM from your computer, depressed, knowing you won’t see it again until you wake up tomorrow. You exit your work building in darkness and walk home. If you’re Alex Balk, and I don’t mean to sway your opinion either way, but if you’re Alex Balk this is what you said this morning in Slack: “keep it dark until noon if it means it’s still light out at 8PM.” Not exactly what we’re discussing right now, but it was essentially the same topic. “I would MUCH RATHER put up with that than the utter sadness of seeing the sun go down while you’re still working,” he said. Mike Dang, however, said, “I like it when the sun wakes me up in the morning” and “dark until noon is crazy.” Again, we’re not speaking specifically about noon/8PM, but — you understand. If you’re the sun rising late you get to not feel exactly like you’re dead when you leave work. If you’re the sun setting late you get to not wake up feeling like you’re already dead.